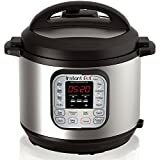 Slow cookers and multi-cookers don’t have a king, but if they did, the Instant Pot DUO60 6 Qt 7-in-1 Multi-Use Programmable Pressure Cooker would rule with an iron fist. This thing is fantastic from top to bottom, but don’t take our word for it — the DUO60 has a 4.6-star rating with more than 22,000 5-star customer reviews! Can you think of another product with more than 22,000 5-star reviews? Neither can we. This is probably the best kitchen tool you’ll ever come across, and we have just the thing to prove it. Order one now with free Prime shipping, and then try this insanely delicious Instant Pot buffalo wing recipe in two days when your new cooker arrives. Don’t worry, you can thank us later.